Advance praise for" West of Eden"
In times past, in an effort to capture the edge and feel of Hollywood during its golden age of glamour and noir, Nathanael West, Raymond Chandler, Carey McWilliams, and Joan Didion stretched language and genre to their limits. Jean Stein and "West of Eden" belong in this company. Kevin Starr, former California State Librarian and author of "California: A History""
In times past, in an effort to capture the edge and feel of Hollywood during its golden age of glamour and noir, Nathanael West, Raymond Chandler, Carey McWilliams, and Joan Didion stretched language and genre to their limits. Jean Stein and "West of Eden" belong in this company. Kevin Starr, former California State Librarian and author of "California: A History"
" [A] compelling, occasionally gossipy, informative chronicle of the flamboyant personalities from a storybook Hollywood era . . . ["West of Eden"] rivets. "Kirkus Reviews"
Through a kaleidoscope of seemingly fragmented voices, patterns form, giving brilliant definition to the very American tragedy of Edie Sedgwick. " Publishers Weekly"
Extraordinary . . . a fascinating narrative that is both meticulously reported and expertly orchestrated. " The New York Times"
An exceptionally seductive biography . . . You can t put it down. . . . It has novelistic excitement. " Los Angeles Times""
Jean Stein s enthralling new oral history, "West of Eden: An American Place, " brings some of [Los Angeles s] biggest personalities to life. . . . As she did for Edie Sedgwick in "Edie: American Girl, " the former "Grand Street" editor harnesses a gossipy chorus of voices, including luminaries like Arthur Miller and Joan Didion. "Vogue"
Stein expertly orchestrates a chorus of voices rich and famous and not-so to create a picture of Hollywood through the lives of five of its most powerful families, drawn to the promise of unmined riches in the oil fields and the fool s-gold sparkle of stardom. The tales of jaw-dropping excess, cruelty, and betrayal are the stuff of movies, and the pleasures are immense. "Vanity Fair"
If there is anyone still laboring under the delusion that great wealth and a couple of palm trees bring happiness, Jean Stein s long-awaited oral history of Los Angeles, "West of Eden, " should put that notion to rest. . . . It is probably not an exaggeration to say that "West of Eden" is the most intelligent, painstakingly researched work of schadenfreude yet produced. Katie Roiphe, "Town & Country"
" [A] compelling, occasionally gossipy, informative chronicle of the flamboyant personalities from a storybook Hollywood era . . . ["West of Eden"] rivets. 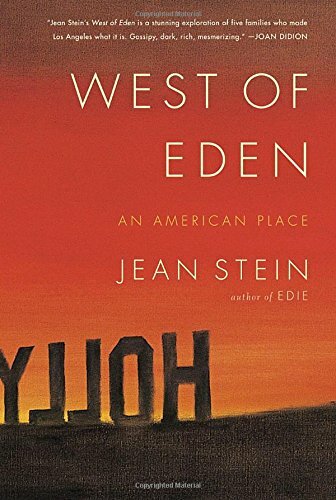 "Kirkus Reviews""
"West of Eden" is compulsively readable, capturing not just a vibrant part of the history of Los Angeles that uniquely American Place [Jean] Stein refers to in her subtitle but also the real drama of this town, as reflected in the lives of some of its most powerful players. . . . It s like being at an insider s cocktail party where the most delicious gossip about the rich and powerful is being dished by smart people, such as Gore Vidal, Joan Didion, Arthur Miller and Dennis Hopper. The result is a mesmerizing book. "Los Angeles Times"
Perhaps the most surprising thing that emerges from this riveting book is a glimpse of what seems like deep truth. It s possible that oral history as Stein practices it . . . is as close as we re going to come to the real story of anything. . . . In a book that s a study of the fleeting nature of worldly power, Stein, now eight-two, has grabbed for herself the only kind that lasts: She s the one left standing, who gets to tell the story. "The New York Times Book Review"
Jean Stein s enthralling new oral history, "West of Eden: An American Place, " brings some of [Los Angeles s] biggest personalities to life. . . . As she did for Edie Sedgwick in "Edie: American Girl, " the former "Grand Street" editor harnesses a gossipy chorus of voices. "Vogue"
Even if you re a connoisseur of Hollywood tales, you ve probably never heard these. . . . As ever, gaudy, debauched, merciless Hollywood has the power to enthrall its audience. "The Wall Street Journal"
In a masterfully conducted symphony of voices, Stein tells the story of a coterie of families including her own in Malibu and Beverly Hills, each profile centered on someone who came with a burst of energy from nowhere to invent a life of riches and fame. Stein s polyvalent oral narrative documents the indelible beauty and giddy decadence of Hollywood s twentieth-century golden age, complete with a parade of glamorous personalities and intrigues worthy of Henry James. "Interview"
By far one of the best books ever written about Hollywood. Gaby Wood, "The Telegraph"